If I Can Dream is a compilation album by American singer Elvis Presley (1935–77). It was released on October 30, 2015 by RCA Records and Legacy Recordings. The album features archival vocal recordings of Elvis accompanied by new orchestral arrangements by the Royal Philharmonic Orchestra. It also features duets with Canadian singer Michael Bublé and Italian trio Il Volo. If I Can Dream was recorded at Abbey Road Studios in London, England, and it was produced by Nick Patrick and Don Reedman. The album debuted at number one in the United Kingdom, giving Elvis a record-equalling 12th UK number one. As of September 2016, the album had sold 1.6 million copies worldwide. A second album featuring the Royal Philharmonic Orchestra, The Wonder of You was released on October 21, 2016. On March 15, 2016, the Daily Mail reported that arena shows in the cities of Glasgow, Leeds, Cardiff, Birmingham, London and Manchester have been already organized where the singer's voice, backed by the live accompaniment from Royal Philharmonic Concert Orchestra' will play to an estimated audience of at least 100,000 people. This will follow the extraordinary success of the album which has sold more than a million copies in the UK. This undertaking will also be backed by Priscilla Presley, who will also participate in the proceedings and was co-executive producer of the album. This is the album I think he always would have wanted to do. The label would have never allowed him to have an orchestra. And if it was up to [manager] Colonel Parker, he would have had Elvis just singing — no background, no nothing. I think we have given him the freedom here to experiment with all the orchestras he would have loved in the pieces." — Priscilla Presley on the album. If I Can Dream was released in commemoration of Elvis' 80th birthday celebration throughout 2015. In an interview with Rolling Stone, Elvis's ex-wife Priscilla Presley, said the vision of the album was to keep Elvis relevant: "Our culture and music has changed so drastically, I think that we have to keep [Elvis] right in line and do whatever we can to keep him current". Priscilla Presley also said the album is carrying the "DNA of Elvis Presley and keeping him authentic". The album was named after Elvis's 1968 single of the same name. Presley continued: "This would be a dream come true for Elvis. He would have loved to play with such a prestigious symphony orchestra. The music…the force that you feel with his voice and the orchestra is exactly what he would have done." After debuting at number 1 in the UK, If I Can Dream tied Presley with Madonna for the most UK number-one albums by a solo artist, with each having 12. It is also Presley's 50th album to hit the UK top 10, and 59 years since his first number-one album on the chart, also a record. It sold 79,000 units in its first week at number one. It became the year's top selling album by a non UK artist, the top three being Adele's 25, Ed Sheeran's x and Sam Smith's In the Lonely Hour. On January 5, 2016, The Independent reported that the album was the 12th best-selling home entertainment title of 2015, which, along with the tremendous success of the aforementioned Adele and Sheeran albums, helped drive a 4% increase in UK music sales with respect of those of 2014. As of October 2016, If I Can Dream had sold 1,861,800 copies in the UK. In the United States, the album debuted and peaked at number 21 on the Billboard 200 after having entered the Billboard Classical Chart at number 17 the previous week. Due to the inclusion of the Royal Philharmonic Orchestra, this marked the first time a Presley record had entered that chart. It then jumped from #17 to #1 in its second week and held that position in its third week, while then successively remaining inside the top 15 positions for the next forty eight weeks. As of September 2016, the album had sold nearly 100,000 copies in the United States. If I Can Dream debuted at #3 on the New Zealand Albums Chart and entered at # 1 in both the Scottish and Australian album charts. In the former, he remained in the first three positions for the next seven weeks, returning to #1 in the ninth. In the latter, it held the top spot for a second week, became Presley's second chart-topping album after ELV1S in 2002 and by December 31 had become the 11th biggest album seller of 2015. ↑ "Elvis Presley 'If I Can Dream' Available Now!". Elvis: The Music. Sony Music Entertainment. October 30, 2015. Retrieved October 31, 2015. 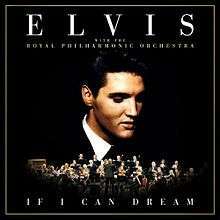 1 2 3 "NEW ALBUM IF I CAN DREAM: ELVIS PRESLEY WITH THE ROYAL PHILHARMONIC ORCHESTRA AVAILABLE OCTOBER 30". Elvisthemusic.com. 5 August 2015. Retrieved 11 September 2015. ↑ "New Elvis Presley Album The Wonder Of You: Elvis Presley With The Royal Philharmonic Orchestra To Be Released October 21 On Sony Music's Legacy Recordings". Legacy Recordings. PR Newswire Association LLC. 8 September 2016. Retrieved 22 October 2016. 1 2 Grow, Kory (12 August 2015). 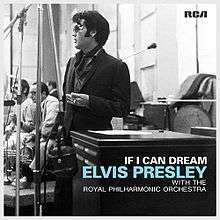 "Hear Elvis Presley's Powerful, Newly Orchestrated 'If I Can Dream'". Rolling Stone. Retrieved 11 September 2015. ↑ "Elvis Presley scores new chart record with 12th UK Number 1 album". officialcharts.com. 1 2 Jones, Alan (October 27, 2016). "Official Charts Analysis: Elvis tops the albums chart again". Music Week. Intent Media. Retrieved October 27, 2016. (subscription required (help)). ↑ Caulfield, Keith (November 12, 2015). "Billboard 200 Chart Moves: Country Albums Rule Top 3 for First Time in 5 Years". Billboard. Prometheus Global Media. Retrieved March 5, 2016. ↑ Lewis, Randy (8 September 2016). "Elvis Presley encores with Royal Philharmonic for 'The Wonder of You' set". Los Angeles Times. Retrieved 22 October 2016. ↑ Ryan, Gavin (November 7, 2015). "ARIA Albums: Elvis Presley Has the No. 1 Album in Australia (Seriously)". Noise11. Retrieved November 7, 2015. ↑ "Australiancharts.com – Elvis with the Royal Philharmonic Orchestra – If I Can Dream". Hung Medien. Retrieved November 7, 2015. ↑ "Austriancharts.at – Elvis with the Royal Philharmonic Orchestra – If I Can Dream" (in German). Hung Medien. Retrieved November 11, 2015. ↑ "Ultratop.be – Elvis with the Royal Philharmonic Orchestra – If I Can Dream" (in Dutch). Hung Medien. Retrieved November 6, 2015. ↑ "Ultratop.be – Elvis with the Royal Philharmonic Orchestra – If I Can Dream" (in French). Hung Medien. Retrieved November 6, 2015. ↑ "Elvis Presley – Chart history" Billboard Canadian Albums Chart for Elvis Presley. Retrieved November 10, 2015. ↑ "Dutchcharts.nl – Elvis with the Royal Philharmonic Orchestra – If I Can Dream" (in Dutch). Hung Medien. Retrieved November 6, 2015. ↑ "Lescharts.com – Elvis with the Royal Philharmonic Orchestra – If I Can Dream". Hung Medien. Retrieved November 27, 2015. ↑ "GFK Chart-Track Albums: Week 45, 2015". Chart-Track. IRMA. Retrieved November 6, 2015. ↑ "Italiancharts.com – Elvis with the Royal Philharmonic Orchestra – If I Can Dream". Hung Medien. Retrieved November 17, 2015. ↑ "Charts.org.nz – Elvis with the Royal Philharmonic Orchestra – If I Can Dream". Hung Medien. Retrieved November 6, 2015. ↑ "Norwegiancharts.com – Elvis with the Royal Philharmonic Orchestra – If I Can Dream". Hung Medien. Retrieved November 15, 2015. ↑ "Official Scottish Albums Chart Top 100". Official Charts Company. Retrieved November 27, 2015. ↑ "Spanishcharts.com – Elvis with the Royal Philharmonic Orchestra – If I Can Dream". Hung Medien. Retrieved November 24, 2015. ↑ "Swedishcharts.com – Elvis with the Royal Philharmonic Orchestra – If I Can Dream". Hung Medien. Retrieved November 7, 2015. ↑ "Swisscharts.com – Elvis with the Royal Philharmonic Orchestra – If I Can Dream". Hung Medien. Retrieved November 11, 2015. ↑ "Official Albums Chart Top 100". Official Charts Company. Retrieved November 7, 2015. ↑ "Official Album Downloads Chart Top 100". Official Charts Company. Retrieved December 26, 2015. ↑ "Elvis Presley – Chart history" Billboard 200 for Elvis Presley. Retrieved November 10, 2015. ↑ "Elvis Presley – Chart history" Billboard Top Classical Albums for Elvis Presley. Retrieved November 10, 2015. ↑ "ARIA Charts - End of Year Charts - Top 100 Albums 2015". Australian Recording Industry Association. Retrieved January 6, 2016. ↑ "The Official NZ Music Charts - End of Year Charts 2015". ↑ Copsey, Rob (January 5, 2016). "The Official Top 40 Biggest Artist Albums of 2015 revealed". Official Charts Company. Retrieved January 5, 2016. ↑ "ARIA Australian Top 50 Albums - Australia's Official Top 50 Albums - ARIA Charts". Australian Recording Industry Association. ↑ "Austrian album certifications" (in German). IFPI Austria. ↑ "British album certifications". British Phonographic Industry. Retrieved December 18, 2015.